Arnold Franz Walter Schoenberg (the anglicized form of Schönberg—Schoenberg changed the spelling officially when he left Germany and re-converted to Judaism in 1933), (September 13, 1874 – July 13, 1951) was an Austrian and later American composer associated with the Expressionist movements in the early twentieth century German poetry and art. He began composing at the young age of ten, producing short pieces that imitated music he had played. He was influenced by the German post-Romantic musical techniques, including the tendency toward atonality, and even surpassed many of its representatives in the intensity with which he employed those techniques. Western music had attained complex harmonies by the end of Romanticism, and Schoenberg, convinced that it could not develop any farther, early on transitioned toward the atonal motivic development. Following this he began organizing notes into sets of 12 with no relationships with each other and with no center, a twelve-tone compositional technique involving tone rows, which he saw as unique and revolutionary because it resembled no music previously composed. This highly intellectual and scientific approach to music brought him both fame and scorn, and many of his contemporaries and subsequent generations of composers were judged on their semblance of Schoenberg's methods. In addition to composing, he was a sought-after music theorist and teacher of composition who understood how to bring out the best in each of his students, who thought highly of him even though they may have disagreed with the twelve-tone technique. Moreover, he was an accomplished painter and prolific writer. Schoenberg was truly a revolutionary in the music world of his day. Arnold Schönberg was born to an Ashkenazi Jewish family in the Leopoldstadt district (in earlier times a Jewish ghetto) in Vienna, Austria. His father Samuel, a native of Bratislava, was a shopkeeper and his mother Pauline, a native of Prague, a piano teacher. His father was described as a free thinker and dreamer, and his mother as a pious Orthodox Jew. Arnold was the eldest of their three children; after him, sister Ottilie and brother Heinrich were born. His friend and teacher Oskar Adler gave him lessons in violin and viola as well as an introduction into music theory and harmony. He started composing when he was ten years old, beginning with small pieces for the instruments familiar to him, imitating music he had played with his teacher or cousin. At the age of 11 he ventured into marches and polkas. By the age of 17, the orthodoxy of his mother and unbiased ways of his father molded him into a nonbeliever who nevertheless encouraged Bible studies. He also took counterpoint lessons with the composer Alexander von Zemlinsky. In his twenties, he orchestrated operettas while composing works such as the string sextet Transfigured Night in 1899, which he later reworked into the well-liked orchestral version. In 1904, he began teaching harmony, counterpoint and composition to talented composers-to-be such as Paul Pisk, Anton Webern, and Alban Berg; Webern and Berg would become the most eminent of his many pupils. Zemlinsky's sister Mathilde, a sophisticated woman and pianist, became Schönberg's wife in 1901. In the summer of 1908, she left him for several months to live with the young Austrian painter Richard Gerstl, who later committed suicide after Mathilde returned to her husband and children. For Schoenberg, this was the beginning of a new musical expression; with Mathilde gone, he composed "You Lean against a Silver-Willow," a work that was not related to any key. Also in this same year he completed one of his most revolutionary compositions, the String Quartet No. 2, whose final two movements, set to poems by German mystical poet Stefan George, weaken the links with traditional tonality daringly—although both movements end on tonic chords, and the work is not yet fully non-tonal, and, breaking with several decades of a string quartet practice, incorporate a soprano vocal line. Pierrot Lunaire, Op. 21, a cycle of 21 Expressionist songs from 1912 set to poems by Belgian symbolist Albert Giraud, was atonal and daringly innovative for its Sprechstimme technique, or speak-singing recitation. The poet imagines himself to be Pierrot and expresses himself by the symbol of the moonbeam, which comes in many shapes and colors, but the songs are macabre rather than comic. The ensemble, consisting of a female speaker/singer clad in a Pierrot costume and five musicians playing flute, (doubling on piccolo), clarinet (doubling on bass clarinet), violin, (doubling on viola), and violoncello, is commonly referred to as the Pierrot Ensemble. Some composers have modified it to include percussion, which often replaces the singer. Schoenberg also authored textbooks, including Harmonielehre (Textbook on Harmony) and Fundamentals of Musical Composition, many of which are still in print and studied by musicians and developing composers. He excelled as a teacher of music, partly due to his habit of engaging with, analyzing, and transmitting the methods of the great classical composers, especially Bach, Mozart, Beethoven, and Brahms, and partly due to his flair for bringing out the musical and compositional individuality of his students. His dodecaphonic method of composition, also known as twelve-tone method, which later grew into serialism, was taken up by many of his students, including Webern, Berg and Hanns Eisler, who represented the Second Viennese School. John Cage was also among his students. Schoenberg's grave in the Zentralfriedhof, Vienna. The onset of Nazism in 1933 forced him into exile in Paris, where he reaffirmed his Jewish faith, and then to the United States. In the United States he taught at the Malkin Conservatory in Boston, followed by a tenure at the University of Southern California in Los Angeles and the University of California, Los Angeles, both of which later named a section of campus where music was taught as Schoenberg Hall. He settled in Brentwood Park, Los Angeles, where he befriended fellow composer and tennis partner George Gershwin and lived there until his death. Toward the end of his life Schoenberg composed several notable works, including the extremely complex Violin Concerto, Op. 36, the Kol Nidre, Op. 39, for chorus and orchestra (1938), the Ode to Napoleon Bonaparte, Op. 41 (1942), the haunting Piano Concerto, Op. 42 (1942), and the memorial to the victims of the Holocaust, A Survivor from Warsaw, Op. 46 (1947). He left behind an uncompleted opera Moses und Aron, which was one of the first works of its genre to be written completely using the dodecaphonic composition. In 1941, he became a naturalized citizen of the United States. He died at the age of 76. Both Richard Strauss and Gustav Mahler recognized Schoenberg's significance as a composer: Strauss when he encountered Schoenberg's Gurre-Lieder, and Mahler after hearing several of Schoenberg's early works. Strauss regressed to a more conservative idiom in his own work after 1909 and at that point dismissed Schoenberg, but Mahler adopted Schoenberg as a protégé and continued to support him even after Schoenberg's style reached a point which Mahler could no longer understand. Mahler worried about who would look after him after his death. Schoenberg was critical of Mahler's early symphonies but Mahler’s music had an impact on him; he was fond of it and praised it. It is said he looked up to Mahler as a saint. Schoenberg converted to Lutheranism in 1898, but in 1933 he returned to his Jewish roots. Schoenberg himself expressed his reasoning for composing the kind of music he did: "Had times been 'normal' (before and after 1914) then the music of our time would have been very different." Being a Jewish intellectual, he was passionately committed to the adherence to an "Idea," such as the concept of an inexpressible God, and the pursuit of truth. He saw the crescendo and imminent saturation in the development of music in the works of Wagner, Strauss, and Mahler. He realized that if music was to regain a genuine and valid simplicity of expression, as was exemplified by his favorite Mozart and Schubert, the language must be renewed. The course that music took with Schoenberg’s innovations grew out of the music of post-Romanticism in Germany, typical of its size and complexity of the score and the violence of expression. His symphonic cantata Gurre-Lieder for five soloists, narrator, four choruses, and large orchestra transcended those traits and composers who exemplified them. In Gurre-Liede and Pelleas he pushed chromaticism to extremes but still within the limits of tonality. However, with the First Chamber Symphony, Five Orchestral Pieces, two sets of short piano pieces, a cycle of songs with piano accompaniment Das Buch der hangenden Garten, Erwartung, and Die gluckliche Hand, he began turning away from the post-Romantic huge blocks of sound toward small instrumental combinations, solo instruments or swift alternation of colors. At the same time, his rhythm and counterpoint became more complex, the line fragmented, and the sound more distilled; his style was unfolding more rapidly than ever before or after. Between 1905 and 1912 Schoenberg digressed from the chromatic style in favor of atonality. He imagined that with his String Quartet Opus 7, and Chamber Symphony Opus 9 he had tapped into a matured style that would serve him well in the future, but as soon as the second String Quartet Opus 10 and the Three Piano Pieces Opus 11 had been completed, he had to admit that the saturation of added notes in harmony had reached a stage where there was no meaningful difference between consonance and dissonance. For a while his compositions remained very concentrated and elliptical as he could see no reason to repeat and develop. These were the same years when the Western world developed abstract painting and psychoanalysis. Many intellectuals felt that thought had developed to a point of no return and it was no longer possible to honestly go on repeating what had been accomplished up to that point. Atonality was foreshadowed by late Romantic, particularly German, music, for instance in Wagner's passages that did not have a clearly identifiable tonal center. Atonal music is not based on the harmonic and melodic relationships revolving around a key center, as was common in the 18th and 19th centuries; and was built on serial principles, for example, 12-tone series. Schoenberg’s compositions between 1908 and 1923 was atonal. World War I brought a crisis in his development; he was drafted into the army and was never able to work uninterrupted or over a period of time, and as a result he left many unfinished works and undeveloped "beginnings." After the war he sought to organize his musical texture into a format that would be simpler and clearer, which resulted in the method of composition with twelve tones, roughly from 1923 on, in which the twelve pitches of the octave are regarded as equal rather than chromatically altered tones of a diatonic scale, and no one note or tonality is given the emphasis it occupied in classical harmony. The pitches of the series are exhausted before they are reintroduced in another form. However, the 12 tones need not be atonal. Schoenberg was not the only, nor the first, composer to experiment with the systematic use of all twelve tones—both the Russian composer Nikolai Roslavets and Schoenberg's fellow Austrian Josef Matthias Hauer developed their own twelve-tone systems quite independently at around the same time as Schoenberg, and Charles Ives had toyed with twelve-tone techniques much earlier. However, Schoenberg's system generated the most imitation and debate. In subsequent years Schoenberg produced a series of instrumental and orchestral works demonstrating how his method could produce new classical music which did not copy the past. The climax was to be an opera Moses und Aron, of which he wrote over two-thirds but was unable to complete, perhaps for psychological reasons. The music ends at the point where Moses cries out his frustration at being unable to express himself. The serialization of rhythm, dynamics, and other elements of music developed after the Second World War by arguing that the twelve-tone music of Schoenberg and his followers of the Second Viennese School had serialized pitch, and was partly fostered by the work of Olivier Messiaen and his analysis students, including Karel Goeyvaerts and Boulez, in post-war Paris. Twelve-tone music is regarded by some as a sub-category of serialism, whereas others regard serialism to be an outgrowth of twelve-tone music. It is essentially a technique for composition that uses sets to describe musical elements, and allows the manipulation of those sets. Serialism is often, though not universally, held to begin with twelve-tone technique, which uses a set of the 12 notes of the chromatic scale to form a row (a nonrepeating arrangement of the 12 tones of the chromatic scale) as the unifying basis for a composition's melody, harmony, structural progressions, and variations. Schoenberg was one of the first composers to experiment with this technique, along with Anton Webern, Alban Berg, Karlheinz Stockhausen, Pierre Boulez, Luigi Nono, and Jean Barraqué. All went through extended periods of time in which they disciplined themselves to always use some variety of serialism in composing. Other composers such as Igor Stravinsky, Benjamin Britten, Aaron Copland, Arvo Pärt, Alfred Schnittke, Dmitri Shostakovich, and even jazz composers used serialism only for particular compositions or only for some sections of pieces. In California, Schoenberg returned to keyed harmony but in a very distinctive way, not simply reusing classical harmony. This was in accordance with his belief that his music evolved naturally from the foundations of the past. To this effect, he would add that "my music is not really modern, just badly played." Schoenberg and Berg were major envoys of Expressionism in music. The term “Expressionism” was first introduced in pictorial arts to represent inner experience. It drew on Romanticism but differed from it in the kind of inner experience it captured and in the tools employed to do so. The artists of that time were preoccupied with modern man that early 20th century psychology analyzed so well: isolated, helpless in the grip of forces they could not grasp, controlled by inner conflict, tension, anxiety, fear, and the drives of the subconscious, and rebelling against the status quo. Schoenberg the expressionist used text as an organizing and unifying tool in his long works. Impressionism, on the other hand, sought to represent the external world as perceived at a given moment. Much of Schoenberg’s work was not well received. In 1907 his Chamber Symphony No. 1 was premiered with a lukewarm response, and its 1913 rendition, which also featured works by Berg, Webern and von Zemlinsky, elicited abusive shouting from the audience. Police had to be called when an altercation broke out during a performance of some songs by Berg. Schoenberg's music had namely rejected tonality, with greatly polarized feedback: his followers and students applauded him as one of the major figures in music, while critics hated him. Schoenberg was said to be a very prickly and difficult man to know and befriend. In one of his letters he said "I hope you weren't stupid enough to be offended by what I said," and he rewarded conductors such as Otto Klemperer, who programmed his music, by complaining repeatedly that they did not do more. On the other hand, his disciples adored him, and even the strongly individualistic Berg and Webern went to great pains to attend to him. Schoenberg's serial technique of composition with 12 notes was among the most central and polemical conversations among American and European musicians of the mid-20th century. Beginning in the 1940s and continuing to the present day, composers such as Pierre Boulez, Karlheinz Stockhausen and Milton Babbitt have extended the legacy of serialism in increasingly radical directions, while even composers normally considered opposed to Schoenberg's point of view, including Igor Stravinsky, Leonard Bernstein and Aaron Copland, began, in the 1950s, 1960s and 1970s, to explore and incorporate some basic tenets of serialism within otherwise basically tonal frameworks. During the 1960s and 1970s, academic conversation was at times almost completely defined in terms of agreement or detraction from the larger serialism method. 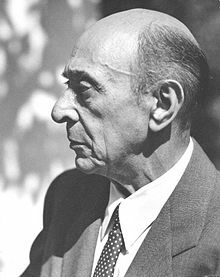 Toward the end of the twentieth century, composers managed to transcend the serial polemic, but new controversies around Schoenberg have sprung up, questioning the importance of serialism to Schoenberg's technique. Composer and writer Chaya Czernowin pinpointed the decentralization of the recognizable motive as Schoenberg's most significant revolution. By contrast, recognizing the diminished importance of serialism in contemporary music history, critics from Pierre Boulez to James Tenney have argued that the overall historical importance of Schoenberg may have been overstated. Schoenberg's genius was not limited to music—he was also a gifted painter, whose works were exhibited alongside those of Franz Marc and Wassily Kandinsky. Writing was another of his passions; he produced plays and poems as well as essays, with topics ranging from music to politics to the social and historical issues of the Jewish people. Auner, Joseph. A Schoenberg Reader. Yale University Press, 1993. ISBN 0300095406. Brand, Julianne, Christopher Hailey, and Donald Harris, (eds). The Berg-Schoenberg Correspondence: Selected Letters. New York, London: Norton, 1987. ISBN 0393019195. Schoenberg, Arnold. Structural Functions of Harmony, Translated by Leonard Stein. New York, London: Norton, 1969 (revised). ISBN 0393004783. Schoenberg, Arnold, (translated by Roy E. Carter). Harmonielehre. (translated title Theory of Harmony.) Berkeley, Los Angeles: University of California Press, 1978. ISBN 0520049454. Schoenberg, Arnold, (edited by Leonard Stein). Style and Idea. London: London, Faber & Faber, 1975. ISBN 0520052943. Some translations by Leo Black; this is an expanded edition of the 1950 Philosophical Library (New York) publication, edited by Dika Newlin. The volume carries the note Several of the essays… were originally written in German, translated by Dika Newlin in both editions. Schoenberg, Arnold. Preliminary Exercises in Counterpoint. Los Angeles: Belmont Music Publishers,  2003. Shawn, Allen. Arnold Schoenberg's Journey. New York: Farrar Straus and Giroux, 2002. ISBN 0374105901. Weiss, Adolph. "The Lyceum of Schonberg," Modern Music 9 (3)(March-April 1932): 99-107. This page was last modified on 14 April 2016, at 15:21.